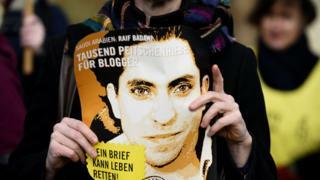 Saudi blogger Raif Badawi, whose flogging sentence caused an outcry, has been awarded the European Parliament's Sakharov human rights prize. Parliament President Martin Schulz urged Saudi King Salman "to free him, so he can accept the prize". Mr Badawi was sentenced to 10 years in jail and 1,000 lashes in Saudi Arabia for "insulting Islam". Earlier this month he also won the Pen Pinter Prize for championing free speech. The Sakharov Prize for Freedom of Thought has been awarded by the European Parliament since 1988 to individuals or organisations for their contribution to the fight for human rights and democracy. It is named after the Soviet scientist and dissident Andrei Sakharov. Mr Badawi, author of the website Free Saudi Liberals, was convicted of insulting Islam in 2012 and fined £175,000. He received the first 50 lashes of his sentence in January, but subsequent floggings have been postponed. In June, Saudi Arabia's Supreme Court upheld the verdict despite a foreign outcry. "This man, who is an extremely good man, an exemplary man, has had imposed on him one of the most gruesome penalties," Mr Schulz told a packed European Parliament assembly in Strasbourg, France. Guy Verhofstadt, leader of the European Parliament's Liberal bloc, said: "The European Parliament has sent today a strong political and humanitarian message to Saudi Arabian authorities." Mr Badawi's wife Ensaf Haidar, now living Canada with their children, said the award was a "message of hope and courage". "I thank the European Parliament," she told AFP news agency. Mr Badawi was one of three nominees for this year's prize along with assassinated Russian opposition leader Boris Nemtsov and the Venezuelan opposition movement Mesa de la Unidad Democratica.